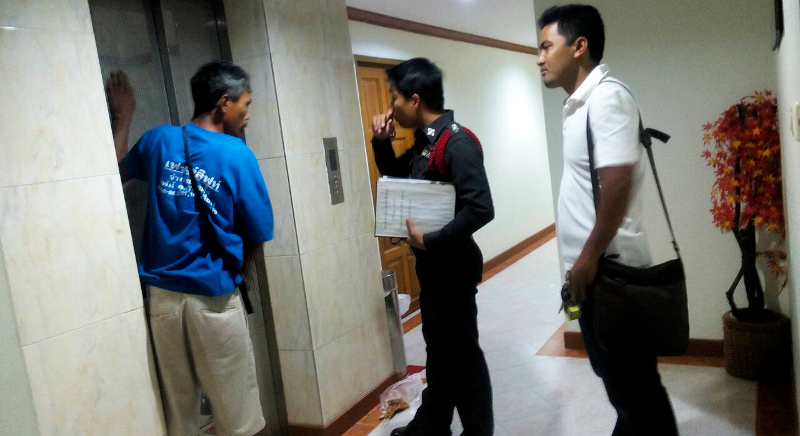 PHUKET: A 54-year-old Swiss man died at about 2:30 this morning (May 22) when he was trapped in the shaft of a malfunctioning elevator at the five-storey Baan Paradise Hotel in Patong. The lift expert and police discuss how to get the dead man out of the lift shaft. The alarm was raised by a receptionist who told police later she had heard a loud thud from the lift and a voice calling for help. She called other hotel staff who found that a flashing light indicated the lift was stuck at the third floor, but were unable to open the lift doors. The Kusoldharm Rescue Service were called. They too could hear a voice calling faintly for help but the lift doors still resisted attempts to open them, so the rescuers called a lift mechanic. When the doors were finally opened the Swiss man was found jammed, head-down, between the lift car and the wall of the lift shaft. He was already dead. The dead man was jammed so tightly that rescue workers were unable to remove him. They winched the lift down in the hope that the body would come free, but it was only on the ground floor that they were finally able to extract the victim. The body of the man, whose name has been withheld until his family have been informed, was taken to Patong hospital. Police have come up with two theories as to what happened. The first is that the victim, who was staying on the fourth floor, had taken the elevator down but it became stuck at the third floor. Possibly he managed to open the car doors but then fell into the gap between the car and the shaft wall. The other possibility is that when the man called the elevator up to fourth floor, the car was already stuck on the third floor. But the doors opened anyway, he walked in and fell, becoming trapped. They said that, whatever the reason, the gap the man became jammed in was so tight that he was unable to breathe. They are currently gathering more information to establish just what happened. The Swiss embassy has been notified of the death.